Is é an Naitsíochas (Gearmáinis: Nationalsozialismus - tá an leagan Nazismus ann chomh maith, ach ní chloistear chomh minic céanna é) an t-ainm a thugtar ar idé-eolaíocht na Naitsithe (Gearmáinis: Nazis), arbh iad baill agus lucht leanúna Pháirtí Náisiúnta Sóisialach Lucht Oibre na Gearmáine (Nationalsozialistische Deutsche Arbeiterpartei, NSDAP) iad. Gluaiseacht chiníoch, fhrith-Ghiúdach ab ea na Naitsithe, agus Adolf Hitler ina cheannaire diansmachtúil orthu. Bhí na Naitsithe i réim sa Ghearmáin sna blianta 1933-1945, agus ba iadsan a chuir tús leis an Dara Cogadh Domhanda. Faoi thionchar na Naitsithe, tháinig rialtais soip ar an bhfód i dtíortha eile a raibh cuma an Naitsíochais orthu, cosúil le rialtas Vidkun Quisling san Iorua. I mblianta an Naitsíochais, bhí Hitler ina dheachtóir ar an nGearmáin, agus é ag cur polasaithe coiriúla i gcrích le cabhrú na Naitsithe. Tar éis an Dara Cogadh Domhanda, bíonn grúpaí beaga nua-Naitsithe ag iarraidh smaointeachas na Naitsithe a athbheochan. Uaireanta, baineann siad úsáid as siombailí na Naitsithe freisin. Is í an svaistíce (Gearmáinis: das Hakenkreuz) an tsiombaile is tábhachtaí de chuid na Naitsithe, ach tá sé coiscthe ag na húdaráis sa Ghearmáin, san Ostair agus san Eilvéis an svaistíce agus comharthaíocht Naitsíoch eile a choinneáil le feiceáil go poiblí. Tháinig coincheap an tSóisialachais Náisiúnta ar an bhfód mar theideal ar chuspóirí Pháirtí Lucht Oibre na Gearmáine (Deutsche Arbeiterpartei, DAP), a tharraing an t-ainm nua úd NSDAP, nó Páirtí Sóisialach Náisiúnta Lucht Oibre na Gearmáine air féin sa bhliain 1920. Roimhe sin féin, i Mí Bhealtaine 1918, fuair Páirtí Gearmánach an Lucht Oibre san Ostair ainm nua den chineál chéanna - Deutsche Nationalsozialistische Arbeiterpartei - Páirtí Sóisialach Náisiúnta Gearmánach an Lucht Oibre. Bhí an dá pháirtí dírithe ar an "sóisialachas náisiúnta" a chur in áit an tsóisialachais idirnáisiúnta a bhí á chur chun cinn ag na Daonlathaigh Shóisialta. Sna páirtithe seo, bhí an corrsmaoineamh frithchaipitleach á mheascadh tríd an náisiúnachas ciníoch. Mar sin, bhí siad in ann vótaí a mhealladh ó na meánaicmí agus ón lucht oibre san am céanna. Maidir leis na Sóisialaigh Náisiúnta sa Ghearmáin, thug siad "gluaiseacht" orthu féin seachas "páirtí", lena leas a bhaint as chomh tuirseach a bhí cuid de mhuintir na tíre den pholaitíocht mar rud. Inniu, is gnách coincheap an tSóisialachais Náisiúnta a ionannú go hiomlán le saoldearcadh ollsmachtúil ciníoch Hitler agus lucht a leanúna. Ní mór cuimhne a choinneáil air, áfach, gur bhain Hitler a chiall féin as an dá choincheap idir Náisiúnachas agus Shóisialachas. Is éard a bhí i gceist leis an Náisiúnachas, dar leis, ná umhlaíocht agus urraim an duine don Náisiún, agus is éard a bhí i gceist leis an Sóisialachas ná an fhreagracht a ghlac an Náisiún as an duine. Is é an tuiscint a bhí ag na Sóisialaithe i gciall cheart an fhocail ar a n-idé-eolaíocht féin ná go gcaithfí na meáin táirgíochta a shóisialú (a chomharshealbhú), ach dhiúltaigh Hitler riamh dá leithéid de Shóisialachas. Thairis sin, theastaigh ó Hitler a idé-eolaíocht féin a dhealú ón bhFaisisteachas, a bhí tagtha ar an bhfód san Iodáil faoi chomandracht Benito Mussolini. San Aontas Sóivéadach, áfach, ba ghnách Faisisteachas a thabhairt ar an dá idé-eolaíocht seo ón mbliain 1925 ar aghaidh, agus i ndiaidh an Dara Cogadh Domhanda, d'éirigh an úsáid seo coitianta i dtíortha Oirthear na hEorpa, a bhí ina satailítí polaitiúla ag an Aontas Sóivéadach. San Iarthar féin ba leasc leis an lucht léinn Marxach úsáid a bhaint as an téarma "Sóisialachas Náisiúnta" le tagairt don Naitsíochas, ó b'ionann sin dar leo agus aitheantas a thabhairt don chiallú gur sórt Sóisialachais é an Naitsíochas. Is é an tuiscint a bhí ag na Marxaigh gur cineál aicmeachas buirgéiseach a bhí i gceist leis an bhFaisisteachas. Tuiscint eile atá i gceist le teoiric an ollsmachtachais, a bhí an-choitianta i measc na staraithe a raibh dearcadh neamh-Shóisialach nó fiú frith-Shóisialach acu. Chuir siadsan an Naitsíochas agus an Stailíneachas ar aon leibhéal le chéile mar chórais ollsmachtacha, agus iad ag díriú ar chosúlachtaí an dá chóras ina gcuid taighde. Bhí an scoil seo breá sásta úsáid a bhaint as na hainmneacha "Sóisialachas Náisiúnta" agus "Naitsíochas". Cumainn bheaga chiníochais a raibh cuma an tseicteachais orthu, agus iad ag teacht ar an bhfód le smaointí Guido von List agus Jörg Lanz von Liebenfels a chraobhscaoileadh ón mbliain 1900 i leith. Cuid de shaol Vín ab ea iad nuair a bhí Hitler ina chónaí ansin. Tháinig na siombailí rúnacha agus an svaistíce ó na dreamanna seo, chomh maith leis an misteachas ciníoch a bhain leis an "gcine Airianach". An Reichshammerbund sa Ghearmáin, arbh é Theodor Fritsch a chathaoirleach, chomh maith le cumainn chosúla eile sa tír sin. Cumainn fhrith-Ghiúdacha a bhí i gceist agus iad ag iarraidh daoine a earcú as measc dreamanna polaitiúla éagsúla. Bhí baint ag na dreamanna seo leis an misteachas ciníoch freisin, nó bhí an rúnchumann úd Germanenorden ag insíothlú an Reichshammerbund. I ndiaidh an Chéad Chogadh Domhanda, d'iompaigh an Germanenorden ina eagraíocht phoiblí, an Thule-Gesellschaft, a bhí ag comhoibriú go dlúth leis na Naitsithe. Mar shampla, sula ndearna na Naitsithe a gcuid féin den nuachtán Völkischer Beobachter, ba leis an Thule-Gesellschaft é. Chabhraigh an Thule-Gesellschaft leis na Naitsithe tacaíocht a fháil ar fud na Gearmáine go léir - ar dtús ní raibh iontu ach páirtí réigiúnach a bhí teoranta don Bhaváir. Cumainn náisiúnaíocha radacacha a raibh blas an impiriúlachais orthu, cosúil leis an gCumann Uile-Ghearmánach nó Alldeutscher Verband, a bunaíodh sa bhliain 1891. Ba é an coilíneachas an chloch ba mhó ar phaidrín an chumainn seo, agus é ag éileamh bunú coilíneachtaí Gearmánacha thar lear. Thairis sin, bhí an cumann seo míshásta le himpireacht ilnáisiúnta na hOstaire agus na hUngáire, ós rud é gurbh é dearcadh an chumainn gur chóir do na Gearmánaigh go léir a bheith ina gcónaí in aon stát amháin. Bhí an Cumann ag cur troda ar na mionlaigh náisiúnta sa Ghearmáin chomh maith - na Polannaigh, na Sorbaigh, na Giúdaigh. Cumainn fhrith-Ghiúdacha, cosúil leis an Deutschnationaler Handlungsgehilfenverband - ceardchumann frith-Ghiúdach do na giollaí siopa - agus an Deutschvölkische Partei. Bhí an Handlungsgehilfenverband ag craobhscaoileadh na hidé go raibh an fear oibre Gearmánach á dhúshaothrú ag na Giúdaigh shaibhre. Thairis sin, bhí an ceardchumann seo ag cur in aghaidh chúis na mban, nó bhí eagla ar na giollaí siopa roimh iomaíocht na mban ar mhargadh na jabanna. Na heisimircigh ón Rúis, bhí cuid mhaith acu ag áitiú gur Giúdaigh a bhí sna Boilséivigh agus gurbh í comhcheilg dhomhanda na nGiúdach a chuir Léinín ag rialú na Rúise. Bhí traidisiún ársa ag an bhfrith-Ghiúdachas sa Rúis, nó ba í rúnseirbhís Impireacht na Rúise a chum Prótacail Sheanóirí Shión, an "cháipéis" bréige a thug cur síos ar "phleananna na comhcheilge Giúdaí". I measc na luath-Naitsithe féin, bhí Gearmánaigh eitneacha ón Rúis a shocraigh síos sa Ghearmáin i ndiaidh na réabhlóide Boilséiví, ar nós Ludwig Maximilian Erwin (Max Erwin) von Scheubner-Richter, a fuair bás an mhairtírigh i München nuair a d'éirigh na Naitsithe amach ansin sa bhliain 1923, agus Alfred Rosenberg, idé-eolaí mór an chiníochais agus an fhrith-Ghiúdachais i measc na Naitsithe. Comhábhair thábhachtacha ab ea an míleatachas, an ciníochas agus an t-impiriúlachas a bhí ag dul i bhfairsinge sa Ghearmáin is san Ostair mar a bheadh falscaí ann, thiar i ndeireadh na naoú haoise fichead. Ba é an frith-Ghiúdachas ba mhó a cheangail dá chéile na dreamanna is na hidéanna éagsúla agus a rinne gluaiseacht Naitsíoch astu. Bhí dlúthbhaint ag an bhfrith-Ghiúdachas leis an bhfrith-Phoblachtachas, nó bhí na Naitsithe agus a gcuid réamhtheachtairí ag caitheamh anuas ar Phoblacht Weimar mar "Phoblacht Ghiúdach", agus is é an t-ainm a thug siad ar bhunaitheoirí na Poblachta ná Novemberverbrecher, is é sin, coirpigh na Samhna, ós rud é gurbh í ceannairc na saighdiúirí i Mí na Samhna 1918 a chuir an chéad síol leis an bPoblacht. stampa poist 1943, "Brandenburger Tor"
Ar dtús, bhí an ghluaiseacht Naitsíoch an-éagsúil ó thaobh an tsaoldearctha de. Mar a dúirt Hans Frank os comhair na cúirte i Nürnberg, bhí an oiread leaganacha éagsúla den Naitsíochas ann agus a bhí daoine sa pháirtí Naitsíoch. Ina ainneoin sin, nuair a bunaíodh an NSDAP, an páirtí, bhí na baill in ann aontú le chéile faoi "chlár oibre na gcúig bpointí fichead ", agus is féidir sórt idé-eolaíochta a aithint sa chlár oibre seo. Thar aon rud eile, bhí stát Mór-Ghearmánach le bunú ina mbeadh cónaí ar na Gearmánaigh go léir. Níor tugadh aitheantas ar bith do chonradh síochána Versailles. Bhíothas ag éileamh tuilleadh tailte agus coilíneachtaí le bia a sholáthar do na Gearmánaigh. Taobh istigh den Ghearmáin féin, bhí an tsaoránacht le bunú ar an bhfolaíocht agus ar an gcine, ionas nach bhféadfadh Giúdaigh ná Gormaigh saoránacht na Gearmáine a bhaint amach. Ar ndóigh, ní bheadh cead acu siúd poist státseirbhíse a fháil ná freagracht phoiblí de chineál eile a ghlacadh orthu féin. Go prionsabálta, bheadh a leithéidí le ruaigeadh as an tír agus ní bheadh cead isteach ag a leithéidí eile. Maidir leis an eacnamaíocht, chaithfeadh gach duine a chuid a shaothrú as allas a mhalacha. Ní íocfaí airgead in aisce le haon duine - is dócha go raibh an t-éileamh seo dírithe in aghaidh na ndaoine saibhre a raibh díbhinní ag dul dóibh, ionas nach gcaithfidís obair ar bith a dhéanamh. Bhí na comhlachtaí móra le sóisialú agus le roinnt idir na gnóthadóirí beaga. D'fhéadfaí a rá go raibh sóisialachas áirithe ag baint le cuspóirí eacnamaíocha na Naitsithe, a bheag nó a mhór. Bhí "lucht an ghaimbíneachais" le cur chun báis gan trua gan trócaire - ar ndóigh, ba iad na Giúdaigh a bhí i gceist le "lucht an ghaimbíneachais". Ní raibh an cead cainte ná saoirse an phreasa go hard ar liosta na Naitsithe - a mhalairt ar fad, bhí deireadh le cur le "bréaga na nuachtán" agus cinsireacht le cur i bhfeidhm ar an bpreas. Ní fhéadfadh na Giúdaigh a bheith ag foilsiú nuachtán ná á gcur in eagar. Chreid na Naitsithe go daingean go raibh a leithéid ann agus "preas domhanda na nGiúdach". Bhí dlúthbhaint ag an tuiscint seo le coincheap "mheath na healaíne" (entartete Kunst): d'áitigh na Naitsithe go raibh comhcheilg na nGiúdach ag iarraidh an ealaín agus an litríocht a chur ó mhaith le hidéanna nua-aimseartha, agus go raibh an tionchar seo le cloí agus ealaín nua Ghearmánach, náisiúnaíoch le cur in áit na "healaíne Giúdaí" trí pholasaithe meabhracha stáit a chur i bhfeidhm i gcúrsaí cultúrtha. Paradacsúil go léir gheall an clár oibre saoirse reiligiúin - ach ar ndóigh, bhí srianta leis an tsaoirse sin: ní raibh cead ag na fíréin "instinn mhorálta an chine Ghearmánaigh a shárú". Bheadh "Críostaíocht dhearfach" de dhíth beag beann ar an teorainn idir Caitliceachas agus Protastúnachas, agus bheadh an cineál seo Críostaíochta ag teastáil mar chrann taca idé-eolaíoch don chath in aghaidh an Ghiúdachais. Nuair a chuaigh na Naitsithe i gcumhacht, chuir siad cath ar na heaglaisí le "comhphobal na gCríostaithe Gearmánacha" a chur chun cinn, cath a bhí bun os cionn ar fad le pointe seo an chláir oibre. Chuir an clár oibre an-bhéim ar an "gcomhleas" agus ar an lárchumhacht láidir stáit a bhí ag teastáil leis an gcomhleas seo a chur chun cinn. Chaithfeadh an sainleas, an leas indibhidiúil agus an fhéinspéis géilleadh do chomhleas an náisiúin. Tríd is tríd, cuireadh an chuid ba mhó den chlár oibre i ngníomh i gcúrsaí na bpolasaithe eachtracha agus inmheánacha, ach san am chéanna, fágadh cuid mhór den pholasaí eacnamaíoch ar lár. Le fírinne, bhí cuid mhór de na cuspóirí eacnamaíocha chomh doiléir nó neamhphraiticiúil is nach bhféadfaí iad a bhaint amach ar aon nós ná slí. Bhí cuid mhór de na Naitsithe tar éis dul leis an bpáirtí ar chúiseanna eacnamaíocha, áfach, agus bhí siad as pabhar míshásta leis an tsiléig seo, agus bhí an dainséar ann go dtitfeadh an páirtí as a chéile faoi bhrú na n-easaontas faoi chúrsaí eacnamaíochta. Mar shampla, bhí Otto Wagener den tuairim gur chóir tacú leis an meánaicme, agus Walther Darré ag éileamh tacaíochta do na feirmeoirí. Bhí Gottfried Feder barúlach gur chóir "an chosmhuintir a shaoradh ó bhráca an ghaimbín", ach ní raibh sé soiléir céard a bhí i gceist aige. Cáipéis thábhachtach idé-eolaíoch eile a bhí i gceist leis an leabhar a scríobh Adolf Hitler nuair a bhí sé ina phríosúnach i Landsberg sna 1920idí - le fírinne, bhreac Rudolf Hess síos an scéal ó bhéal Hitler. 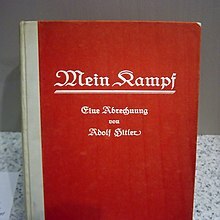 Sa leabhar seo, dheimhnigh Hitler cuspóirí na Naitsithe i gcúrsaí eachtracha, an t-Anschluss ach go háirithe - is é sin, nascghabháil na hOstaire agus bunú na Mór-Ghearmáine a chuimseodh an Ostair chomh maith leis an "nGearmáin Bheag". Theastaigh uaidh tuilleadh tailte a ghabháil don Ghearmáin, ach ní raibh suim aige i gcoilíneachtaí taobh amuigh den Eoraip: b'fhearr leis tíortha na hEorpa Thoir a shealbhú agus a choilíniú don Ghearmáin. Is dócha go raibh sé faoi thionchar smaointeoirí "geopholaitiúla" cosúil le Rudolf Kjellén ón tSualainn, Halford Mackinder ón Ríocht Aontaithe agus Karl Haushofer ón nGearmáin, agus iad den tuairim gurbh é an forlámhas san "Eoráise" eochair an fhorlámhais dhomhanda. Thairis sin, nuair a bhí Ord na Ridirí Teotanacha ag rith damhsa in Oirthear na hEorpa sa Mheánaois, bhí miotas acusan faoin Drang nach Osten, an tarraingt soir a bhí, mar dhea, i ndúchas an Ghearmánaigh, agus is léir gur chuala Hitler an sean-nath seo freisin. Is iad an Rúis agus na stáit idir an Ghearmáin agus an Rúis ba mhó a bhí ag teastáil ó Hitler mar thailte breise don Ghearmáin. Is é an plean a bhí ag Hitler le hOirthear na hEorpa a fhorghabháil ná go ndéanfadh sé athruithe ar chonradh síochána Versailles ar dtús agus go rachadh sé i gcomhghuaillíocht le Sasana (!) agus leis an Iodáil in aghaidh na Fraince. Athrú ab ea é seo ar an tríú pointe i gclár oibre an pháirtí Naitsíoch. Is é an tuiscint a bhí ag Hitler go gcaithfeadh an Ghearmáin a ghealladh don Ríocht Aontaithe nach raibh coilíneachtaí Shasana ag teastáil ó na Gearmánaigh ar aon nós. Mar sin, gheobhadh na Gearmánaigh cead a gcinn is a gcos ar fud Mhór-roinn na hEorpa. Ó thús na fichiú haoise bhí sé de chlaontacht i stáit na hEorpa go léir dul le polaitíocht údarásúil fhrithdhaonlathach. Chuaigh an sruth seo i méadaíocht i ndiaidh an Chéad Chogadh Domhanda, ó bhain an cogadh agus an bochtanas a lean é mealladh as a lán daoine. Sa Ghearmáin, bhí cineál réamh-mhúnla do chultas an cheannasaí údarásúil ann: cultas an Impire. I ndiaidh an chogaidh, níor chreid aon duine san Impire a thuilleadh, ach nuair a d'imigh cultas an Impire, d'fhág sé bearna i gcroíthe a lán daoine sa Ghearmáin, agus iad ag dréim le ceannasaí láidir nua. Tháinig deachtóirí ceannasacha i gcumhacht sa Spáinn (Franco), san Iodáil (Mussolini) agus san Aontas Sóivéadach (Stailín). Thosaigh cultas an cheannasaí sa Ghearmáin sách luath, fiú i bhfad sular shealbhaigh na Naitsithe an chumhacht. Nuair a thit an tóin as ceannairc an bheoirhalla i München sa bhliain 1923, is é an tátal a bhain Hitler as an iomlán ná go gcaithfeadh sé féin dul i gceannas ar an bpáirtí agus ar an nGearmáin féin gan aon údarás eile a cheadú, ó ba é sin a chinniúint. Le fírinne ní raibh cosmhuintir an pháirtí ag súil lena mhalairt uaidh. Mar sin, b'ionann cultas an cheannasaí agus comhdhlúthú an pháirtí: de réir mar a thug na baill urraim agus dílseacht do Hitler, dúnadh na ranganna agus rinneadh dearmad de na deighiltí agus de na difríochtaí idé-eolaíocha. Na héasclínte a bhí ag scoilt an pháirtí roimhe sin, ní raibh siad tábhachtach a thuilleadh. Nuair a tháinig na Naitsithe i seilbh an stáit sa bhliain 1933, níor theastaigh uathu deachtóireacht mhíleata a dhéanamh de, ach stát ceannasach. Mar sin, d'fhéach siad chuige nach mbeadh cumhacht ar bith ag aon duine eile seachas ag Hitler: nuair a fuair an tUachtarán Hindenburg bás sa bhliain 1934, níor toghadh uachtarán nua don stát, agus sa bhliain 1938, d'éirigh na hairí rialtais as a gcuid cruinnithe, ó bhí iomlán na cumhachta ag Hitler agus ag a fhoireann pé scéal é. 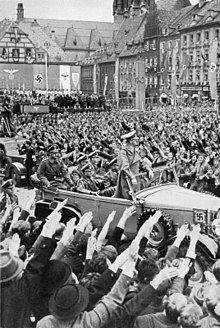 Is eol dúinn gur mhair an tAontas Sóivéadach beo breis is tríocha bliain i ndiaidh bhás Stailín, nuair a bhásaigh an Tríú Reich agus Adolf Hitler féin go comhuaineach. Is é is cúis leis seo ná go raibh difríochtaí prionsabalta in eagrú praiticiúil an dá dheachtóireacht. Nó bhí Hitler ag cur a ladair i ngach cineál cúrsaí, agus é ag eisiúint a chuid orduithe agus achtanna féin faoi seo is siúd. Mar sin, ní raibh an maorlathas in ann oibriú as a stuaim féin i ndiaidh a bháis. Bhí gach duine ag fanacht le horduithe oifigiúla ó Hitler, agus nuair nach raibh Hitler ann a thuilleadh, ní raibh an córas in ann maireachtáil ní ba mhó. Bhí an caidreamh neamhoifigiúil le Hitler ní ba tábhachtaí ná slabhra oifigiúil foirmeálta an cheannais. San Aontas Sóivéadach, bhí gach duine tábhachtach tar éis scolaíocht idé-eolaíoch Chumannach a fháil, agus muinín áirithe acu astu féin go raibh siad in ann cinneadh ar an rud ceart as a stuaim féin. Sin é an rud a choinnigh an tAontas Sóivéadach ag imeacht ar feadh i bhfad i ndiaidh bhás Stailín. An stát ollsmachtúil: treascraíodh an daonlathas, cuireadh an córas aon pháirtí ina áit, cuireadh trídheighilt na gcumhachtaí (an chumhacht feidhmiúcháin, an chumhacht reachtach, agus na breithiúna) ar ceal, hiompaíodh na forais pholaitiúla agus na hollmheáin chumarsáide ina n-uirlisí i lámh an Pháirtí, bronnadh cumhachtaí cuimsitheacha ar na seirbhísí rúnda agus ar na brathadóirí, rinneadh stát poilíneach den Ghearmáin. Míleatachas agus impiriúlachas: Bhí na Naitsithe ag cur airm thine i bhfolach i bhfad roimh shealbhú na cumhachta. Tugadh oiliúint ar dhronga armtha bruíonachais, agus iad ag ionsaí daoine ó ghrúpaí polaitiúla eile amuigh sna sráideanna. I mblianta Phoblacht Weimar bhí an bholscaireacht dírithe ar chonradh síochána Versailles agus ag éileamh go gcuirfí an conradh ar ceal. Bhí na bolscairí ag caitheamh anuas ar "chonradh náire Versailles", agus iad ag áitiú gur chóir don Ghearmáin na críocha caillte san Oirthear a fháil ar ais. Sa bhliain 1933, agus na Naitsithe ag rialú na tíre, thosaigh an téisclim chogaidh, agus ligeadh na conarthaí síochána i ndearmad de réir a chéile. Bhí Hitler meáite ar chogadh forghabhála a thosú a thúisce is a bheadh na fórsaí armtha sách láidir. Ansin, d'iompódh an Ghearmáin ina mórchumhacht agus lámh láidir á beartú aici ar na tíortha eile. D'fhéachfadh Hitler chuige go mbeadh na tíortha go léir chomh drochamhrasach i leith a chéile is nach bhféadfaidís dul i gcomhghuaillíocht in aghaidh na Gearmáine. Chloífí iad ceann i ndiaidh a chéile. Sa deireadh, bheadh an Ghearmáin i seilbh Mhór-roinn na hEorpa go léir, agus bhunófaí coilíneachtaí Gearmánacha thall agus abhus, le súil is go gcoinneoidís súil ghéar ar bhunadh na dtíortha. Thairis sin, áit ar bith a sealbhódh na Gearmánaigh na ceantair mheithe, dhíbreofaí bunadh na háite. Bheadh na coilínigh Ghearmánacha ina bhfeirmeoirí agus ina saighdiúirí san am chéanna (Wehrbauern, nó "feirmeoirí cosanta"), ionas go bhféadfaidís na bundúchasaigh a choinneáil faoi smacht agus an Ghearmáin a chosaint ar ionsaithe. Ról lárnach na mórimeachtaí stáitsithe (cluichí Oilimpeacha Bheirlín, cuir i gcás, nó Ard-Fheis Pháirtí na Naitsithe i Nürnberg). An miotas "fola agus úire". Bhí idé-eolaithe an Naitsíochais míshásta le saol salach "Giúdach" na cathrach, agus iad ag brionglóidigh faoi shaol glan "Gearmánach" na tuaithe. Bhí baint ag na hidéanna seo le himpiriúlachas na Naitsithe, mar a chonaic muid thuas, ó bhí sé pleanáilte acu (ag Heinrich Himmler ach go háirithe) na tíortha forghafa a choilíniú le feirmeoirí Gearmánacha. Coincheap an "mháistirchine". Is é sin, bhí na bolscairí ag áitiú gurbh iad na Gearmánaigh an "máistirchine", agus iad i dteideal na ciníocha eile a smachtú agus a chur i ndaoirse. San am chéanna, bhí siad ag rá go raibh na ciníocha fodhaonna ag bagairt ar an máistirchine agus go gcaithfeadh an máistirchine troid agus cath a chur ar a shon féin. Nuair a bhí an cogadh ag teip ar Hitler, bhain sé an tátal loighciúil as an neamhloighciúlacht seo, nó ghlac sé leis go raibh ciníocha eile tar éis bua a bhreith ar an "máistirchine", agus go gcaithfeadh an "máistirchine" stáitse na staire domhanda a fhágáil ag ciníocha ba láidre ná é - na Rúisigh agus na Meiriceánaigh mar shampla. D'ordaigh sé dá chuid trúpaí infreastruchtúr na tíre a scrios go hiomlán - Nerobefehl, nó "ordú Nearó", a thugtar ar an ordú seo, i gcuimhne ar an Impire Rómhánach Nearó, "nach raibh ach ag seinm na cláirsí", nuair a bhí an Róimh ag dul trí thine, mar a deir an seanchas. Cultas na feargachta, na fearúlachta agus na suáilcí fearúla. Bhí míleatachas an Naitsíochais fite fuaite le cultas na feargachta. Ón taobh eile de, bhí fuath ag na hidé-eolaithe Naitsíocha ar an "mbaineandacht" agus ar an "bpiteogacht", nó chuirfeadh na "fir bhaineanda" cumas cosanta na tíre ó mhaith, dar leo. Na teoiricí comhcheilge faoin "nGiúdach idirnáisiúnta". Tá cuid mhór de lucht scríofa na staire ar aon bharúil gurbh í an teoiric faoi chomhcheilg dhomhanda na nGiúdach dlúth agus inneach an Naitsíochais. Is féidir na teoiricí seo a aithint ar chomhrá Hitler le Dietrich Eckart a foilsíodh chomh luath leis an mbliain 1924. Sa chomhrá seo, bhí Hitler agus Eckart den tuairim go raibh leanúnachas dobhriste ag dul ó "scéimeanna na nGiúdach" roimh bhreith Chríost go "scéimeanna comhaimseartha na nGiúdach". Sna pictiúir a d'fhoilsítí, cuir i gcás, ar an Stürmer, iris na bolscaireachta frith-Ghiúdaí, chuirtí síos ar an "nGiúdach" mar dhamhán alla a bhí ag coinneáil an domhain idir a chuid cos. Tugadh le fios go raibh lámh an Ghiúdaigh ag stiúradh na n-imeachtaí comhaimseartha go léir. Má bhí lucht an rachmais ag dúshaothrú an lucht oibre, chuaigh an Stürmer i dtuilleamaí na sean-steiréitíopaí den "rachmasóir Ghiúdach". Má bhí an Cumannachas ag bagairt, d'fhógair an Stürmer gur Giúdaigh a bhí sna Boilséivigh, agus mar sin de. bolscaireacht pholaitiúil - "Is é an Marxachas aingeal cosanta an chaipitlíochais." cén cineál polasaithe eacnamaíocha a bhí ag na Naitsithe nuair a tháinig siad i gcumhacht faoi dheireadh. Is é an dearcadh a bhíonn ag na staraithe Marxacha gurbh iad na rachmasóirí móra a chuir Hitler i gceannas ar an tír, chomh fial flaithiúil is a bhí siad - leithéidí Fritz Thyssen agus Emil Kirdorf - ag tál airgid agus cabhrach eile ar Hitler nuair nach raibh ann ach mionpholaiteoir go fóill. Seo an tuiscint a bhí ag an staraí Oir-Ghearmánach Eberhard Czichon. Ní raibh lucht staire an Iarthair sásta glacadh leis an gciallú seo, áfach. Is éard a dúirt Reinhard Neebe, cuir i gcás, nárbh é Hitler ba mhó a fuair tacaíochta ó na rachmasóirí, ach na seansailéirí a tháinig roimhesean, ar nós Heinrich Brüning agus Franz von Papen. Rinne an staraí Meiriceánach Henry Ashby Turner taighde ar fhoinsí airgid na Naitsithe agus is é an tátal a bhain sé as ná gur ag Neebe ba mhó a bhí an ceart. Is é sin, fuair na Naitsithe an chuid ba mhó den airgead ó ghnáthbhallra an pháirtí. Níor thacaigh na caipitlithe leis na Naitsithe ach amháin ar eagla na heagla, nó ba iad an Zentrum, an DNVP agus an DVP na páirtithe ba mhó a thaitin le lucht an mhór-rachmais. Bhí eilimintí frithchaipitleacha le haithint ar idé-eolaíocht na Naitsithe, ach an chuid is mó acu bhí baint acu leis an bhfrith-Ghiúdachas, agus b'ionann an rachmasóir agus an Giúdach sa bholscaireacht go minic. Cúis conspóide é, an raibh tábhacht ar bith ag an bhfrithchaipitleachas i bpolasaithe an pháirtí, go háirithe i ndiaidh do Hitler lucht leanúna Gregor agus Otto Strasser a phurgú nó a chloí. Bhí clár na gcúig bpointí fichead i bhfeidhm sa pháirtí go dtí an bhliain 1926, agus Hitler féin ag áitiú nach n-athrófaí pointe amháin sa chlár oibre seo. Bhí a lán de na pointí seo ag éileamh ionsaí ar an gcaipitleachas: bhí cumhacht an ghaimbíneachas le briseadh, bhí na hiontaobhais le náisiúnú, agus chaithfeadh an chosmhuintir a gcuid féin a fháil de bhrabús na ngnólachtaí móra. Bhí tionchar an tSóisialachais le haithint sna hóráidí a thugadh Joseph Goebbels, Otto Strasser agus a dheartháir Gregor i ré luath an pháirtí Naitsíoch. D'fhág Otto Strasser agus a lucht leanúna an páirtí sa bhliain 1930. Hitler féin, d'admhaigh sé go soiléir nach raibh sé le deireadh a chur leis an úinéireacht phríobháideach, ach nuair a tháinig na Naitsithe i gcumhacht, níor leasc leo maoin shaolta na nGiúdach agus na naimhde polaitiúla a shóisialú. Tugadh an leathanach seo cothrom le dáta an 13 Samhain 2018 ag 20:24.